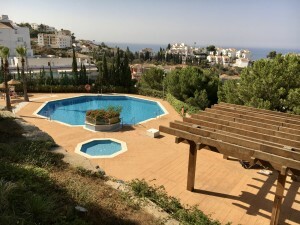 This very spacious (420 m2) 6 bedroom quality villa is located in the popular El Lagar area of Alhaurin de la Torre - just a 5 minute walk from the main street where you will find bars, schools, shops and restaurants. The villa offers beautiful views of the valley all the way down to Malaga Bay and consists of 2 separate living areas divided over 3 floors. On the main floor you will find 2 bedrooms with ensuite bathrooms, a fully fitted modern kitchen with utility room and a bright living/dining room with fireplace, high ceilings, large windows and cream marble floors. The top floor offers another 2 bedrooms with private terraces and a bathroom. Downstairs you will find a self-contained 100 m2 guest apartment which can be enlarged even further. It currently consists of a living/dining room, kitchen, storage room, 2 bedrooms and 1 bathroom. The villa is built on a spacious almost 1,300 m2 plot using only high quality materials. It offers a large driveway with carport and a low-maintenance garden with a private swimming pool, a changing room with toilet, a storage room and several covered and open terraces to enjoy both sun and shade all day long. It's just a 10 minute drive to both the beach and the airport - and the beautiful historic centre of Malaga is only a 15 minute drive away.